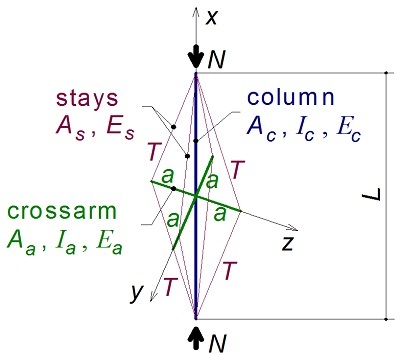 Stability and strength of imperfect stayed columns are studied in 3D using ANSYS software. Following three tests of stayed columns with a reasonable geometry, the numerical modelling is validated and subsequently compared with available analytical and numerical 2D results. Arrangement and values of prestressing of ties and initial deflections of the columns affecting the nonlinear stability problem are discussed in a detail. The effect of nonlinear stress-strain relationship corresponding to common stainless steel material is shown, with respect to loading level corresponding to loss of the column stability. The assembly technique of the stayed columns is taken into account, comparing the method and stability/strengths of columns with fixed or sliding stays in the connection to the central crossarm. Finally some recommendations concerning the analysis and use of such stayed columns are given. K. H. Chu and S. S. Berge, “Analysis and design of struts with tension ties,” Journal of the Structural Division ASCE, vol. 89, no. ST1, pp. 127-163, February 1963. R. J. Smith, G. T. McCaffrey, and J. S. Ellis, “Buckling of a single-crossarm stayed column,” Journal of the Structural Division ASCE, 11071 ST1, pp. 249-268, January 1975. H. H. Hafez, M. C. Temple, and J. S. Ellis, “Pretensioning of single-crossarm stayed columns,” Journal of the Structural Division ASCE, 14362 ST2, pp. 359-375, February 1979. K. C. Wong and M. C. Temple, “Stayed columns with initial imperfections,” Journal of the Structural Division ASCE, 108 ST7, pp. 1623-1640, 1982. S. L. Chan, G. Shu, and Z. Lü, “Stability analysis and parametric study of pre-stressed stayed columns,” Engineering Structures, vol. 24, no. 1, pp. 115-124, January 2002. D. Saito and M. A. Wadee, “Post-buckling behaviour of prestressed steel stayed columns,” Engineering Structures, vol. 30, no. 5, pp. 1224-1239, May 2008. D. Saito and M. A. Wadee, “Numerical studies of interactive buckling in prestressed steel stayed columns,” Engineering Structures, vol. 31, no. 2, pp. 432-443, February 2009. R. R. Araujo, S. A. L. Andrade, P. C. G. S. Vellasco, J. G. S. Silva, and L. R. O. Lima, “Experimental and numerical assessment of stayed steel columns,” Journal of Constructional Steel Research, vol. 64, no. 9, pp. 1020-1029, September 2008. K. Servitova and J. Machacek, “Analysis of stainless steel stayed columns,” Proceedings 6th Intern. Symp. Steel Structures, Korean Society of Steel Construction, Seoul, pp. 874-881, 2011. L. R. O. Lima, P. C. G. Vellasco, and J. G. S. Silva, “Numerical modelling of prestressed stayed stainless steel columns,” Tubular Structures XIV, Taylor and Francis, London, pp. 377-382, 2012. A. I. Osofero, M. A. Wadee, and L. Gardner, “Experimental study of critical and post-buckling behaviour of prestressed stayed steel columns,” Journal of Constructional Steel Research, vol. 79, pp. 226-241, December 2012. M. A. Wadee, L. Gardner, and A. I. Osofero, “Design of prestressed stayed columns,” Journal of Constructional Steel Research, vol. 80, pp. 287-298, January 2013. R. Pichal and J. Machacek, “3D stability of prestressed stayed columns,” Proceedings 22nd Intern. Conf. Engineering Mechanics, Inst. of Thermomechanics, Academy of Sciences of the Czech Republic, Svratka, pp. 462-465, 2016. R. Pichal and J. Machacek, “Buckling and post-buckling of prestressed stainless steel stayed columns,” Procedia Engineering, vol. 172, pp. 875-882, 2017. J. Machacek and R. Pichal, “Single-Crossarm Stainless Steel Stayed Columns”, AITI, vol. 3, no. 1, pp. 9-16, Jan. 2018. Submission of a manuscript implies: that the work described has not been published before that it is not under consideration for publication elsewhere; that if and when the manuscript is accepted for publication. TAETI is the copyright holder of the journal content on the journal website. From Jan. 01, 2015, AITI will publish new articles with Creative Commons Attribution Non-Commercial License, under Creative Commons Attribution 4.0 International Public License.